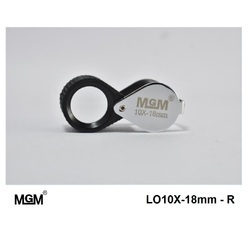 - 10 times magnification power for extra sharpness and clarity. 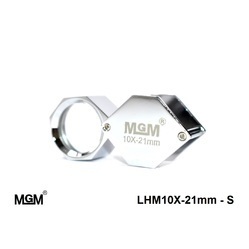 - Ideal for finding the hallmarks on silver and gold. 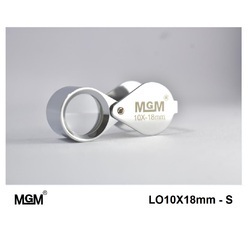 10 times magnification power for extra sharpness and clarity. With complete chromatic accuracy and distortion-free viewing from every angle, this magnifier represents the summit of lenscrafting. The Lightweight, compact design and the fine brushed-steel finish are a delight to the senses. But it is the purity of the glass and the unsurpassed precision on the three-lens design that make this loupe a top choice for the critical task of evaluating diamonds. Every detail is revealed in stunning clarity. With an effective magnification power of 10x. Delivered with a handy protective valvet pouche. 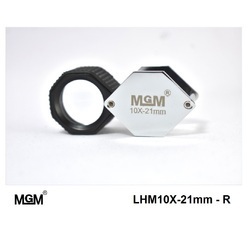 Foldable and portable Loupe Magnifier is convenient to keep-with.